Mumbai, April 18 (IANS) The National Gallery of Modern Art (NGMA) in Mumbai will display, from Friday, the internationally acclaimed exhibition "The Last Harvest" featuring paintings of Nobel laureate Rabindranath Tagore, an official said. "The Last Harvest," curated by noted art historian Prof R. Sivakumar, was developed by the ministry of culture, government of India, to commemorate the 150th birth anniversary of Tagore that fell on May 8, 2012. "This exhibition, after travelling across nine cities in three continents, has returned to India. The exhibition consists of 104 original paintings of Tagore which have been divided into four thematic sections: The Discovery of Rhythm; Images of Nature; Theatre of Gestures; and "Between Masks and Portraits", said Shivprasad Khened, director of NGMA. "Many of his works are populated with agile figures that seem to sometimes acrobatically morph into various forms found in nature, which form the feature of this exhibition," he added. According to Sivakumar, Tagore's life, his works and the history of his institutions mark a progress from nationalism to universal humanism. "His paintings belong to the period of universal humanism. Linked as they may be to personal experiences, they have a universal appeal. 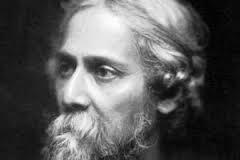 In consonance with it, Tagore did not title his drawings and paintings. He also did not date most of them," he said. "Thus, they come to us as an open-ended oeuvre, encouraging us to respond to them with our sensibilities and find linkages between them. In other words, he encourages viewers to embark on a curatorial process. This exhibition is one such effort," he said. Sivakumar said that the paintings in this exhibition have an element of playful inventiveness and involve morphological cross-projections that defy perceptual experience. "If the subliminal played an important part in his first paintings, painting itself led him to pay attention to the pageant of forms in nature. The landscapes included in these selections are a token of this shift," Khened said.